In a junction ﬁeld-effect transistor (JFET), the electrons do not cross the p-n junction but, rather, ﬂow from the source to the drain along a so-called n-channel, which is formed between two p-type materials (Fig). The n-channel is considered the output section of the transistor, and the gate-to-source p-n junction is the input section. In a typical JFET circuit (Fig. 1.18), where the transistor functions as a digital switch, the voltage supply VSD is applied across the (–) source and the (+) drain terminals, through a load resistor RL. The input voltage VGS is connected between the gate and source terminals with the negative polarity on the gate. With a reversed bias input voltage, the effect of the electric ﬁeld creates depletion areas around the two p-n junctions, which are characteristically devoid of electrons. As the input voltage increases, the depletion areas penetrate deeper toward the center of the channel, restricting the electron ﬂow between the source and the drain (Fig). If the input voltage is large enough, the depletion areas will totally ﬁll the nchannel, choking off the ﬂow of electrons. Reducing the input voltage VGS to zero, the depletion areas disappear, and the n-p channel is wide open, with very low resistance; thus, the electron ﬂow rate will be at its maximum. 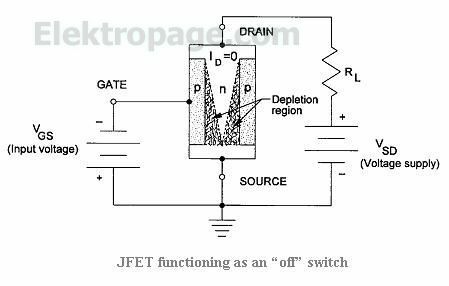 When the JFET transistor is used as a linear ampliﬁer, the input voltage variation will have an equivalent effect on the current ﬂow in the n-channel and cause an output voltage gain across the source and drain terminals.